A simple, automated drip-irrigation system, which applies water slowly and directly to roots, frees you from hand-watering and helps eliminate harmful fluctuations in soil moisture. Plants respond by growing full and lush. And you’ll never have to drag around another hose. The system must have a backflow prevention device, which keeps irrigation water from flowing back into the household water lines; a filter, to trap particles that could clog emitters; a pressure regulator, which lowers the incoming water pressure to a level the drip system can tolerate; and a compression fitting, to connect the tubing to the pressure regulator. 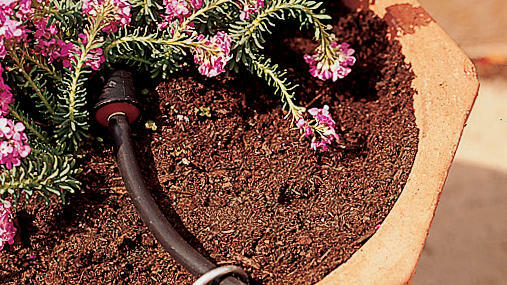 The simplest way to hook up a drip system is to connect it to an existing hose bibb (with a Y attachment so you can still attach a hose). You can operate the system manually or you can add a battery-operated timer. The other option is to connect directly to the water line using an automatic valve. This makes the most sense if you already have an automatic controller (it’s usually simple to add another valve) or you plan to install other systems that will run off the same controller. To get water out to the containers, use either 3/8- or 1/2-inch black polyethylene tubing for the main line. Hide it anywhere it won’t be seen. Keep 1/2-inch tubing shorter than 200 feet and 3/8-inch lines shorter than 100 feet, since longer lines can cause uneven water distribution. Next, run 1/4-inch microtubing into the pots (vinyl is preferable to polyethylene, since it’s more flexible). You can run it over the lip of a pot or up through the drainage hole (but then the pot can’t easily be moved). For hanging baskets, run microtubing up posts, under eaves, or in the joint between two walls. 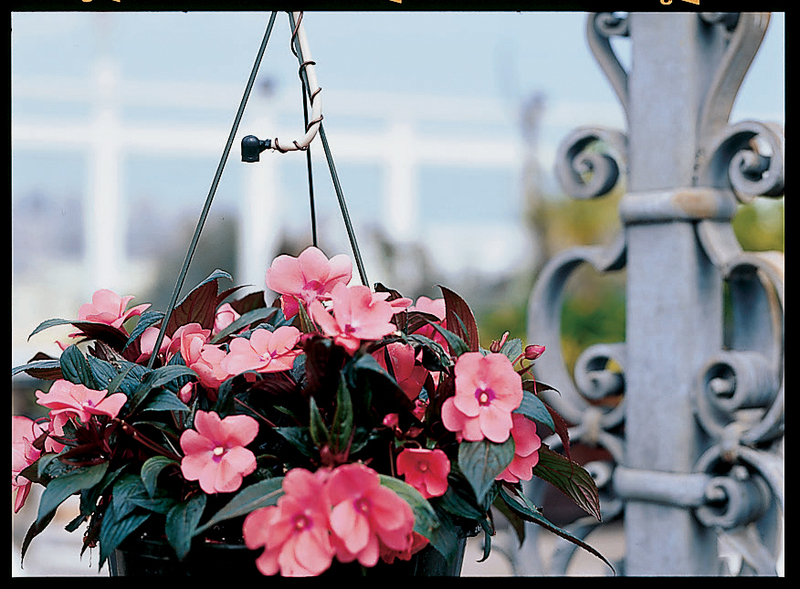 To prevent backflow on hanging baskets, leave 2 inches between emitters and foliage or soil, or place an atmospheric vacuum breaker on the line 6 inches above the highest emitter. A 2- to 4-gallon-per-hour mister sprays the soil and the foliage. Bonsai wire keeps mister head pointing in the right direction. All containers running off the same valve will be watered for the same amount of time, but they may not need the same amount of water. To compensate, set up the system for the smaller pots, then put extra emitters in larger ones. Use one 1/2-gallon-per-hour (gph) emitter for a pot up to 10 inches wide and two 1/2-gph emitters on a T fitting for medium-size pots up to 15 inches wide. For larger containers, make a ring of emitters – four 1/2-gph for a 16-inch-wide pot, more emitters and a bigger circle as pot size increases. Or use 1/4-inch emitter line with factory-installed emitters at 6-inch intervals. An emitter line can also be used in a straight line to water a rectangular container or a window box. For some pots, you may want a specialty emitter such as a mister or a bubbler. How long do you run the system? Test your system by running it for 5 to 10 minutes. After watering, the soil should be thoroughly wet, with some water draining out of the container bottoms. If water floods out, you have run it too long; if no water comes out and the soil isn’t thoroughly moist, you need to run the system longer or change to larger emitters. Most controllers allow you to run the system several times a day, which is particularly useful in hot climates.